Join the LARGEST Endovascular and Interventional Radiology Conference in the Middle East! Granted by the European Accreditation Council for Continuing Medical Education (EACCME®) with 26 European CME credits (ECMEC®s). Each year we invite renowned experts in the field to speak. 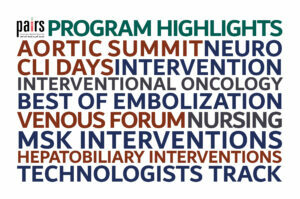 View this year’s congress topics, highlights, target audience, accreditation details and more. Book your hotel accommodation through the online portal for the Grand Hyatt and Rove Hotel to avail of special rates for delegates attending the congress. The PAIRS is pleased to inform you that Emirates Airlines has proudly been selected as the partner airline for the Pan Arab Interventional Radiology Society (PAIRS) Annual Scientific Meeting 2019.